Adds menu to Safari for developers. Is there a better alternative to Safari WebDevAdditions? Is Safari WebDevAdditions really the best app in HTML category? Will Safari WebDevAdditions work good on macOS 10.13.4? 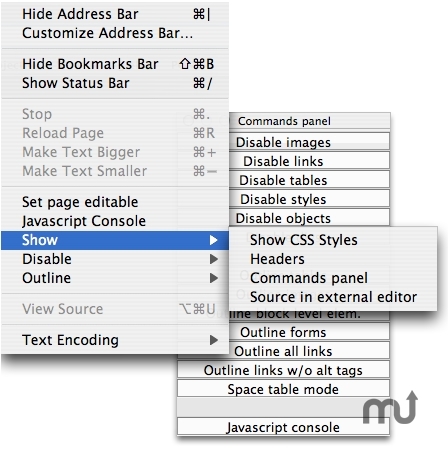 WebDevAdditions adds a menu to the Safari browser with few useful functions for Web developers. It allows to disable (hide) images, shows table structure, block level elements (divs, paragraphs, forms), various informations about images (size, path), links, CSS's. Updated for work with Safari v. 41 - coming with Mac OS X 10.4.7. Safari WebDevAdditions needs a rating. Be the first to rate this app and get the discussion started!